CAVU and the Rio Grande Chapter of the Sierra Club recently created a successful partnership conducting overflights and producing a short video highlighting major areas of pollution from methane gas leaks in northwestern New Mexico’s San Juan Valley. Following on the heels of this collaboration and CAVU’s dedication to climate change initiatives, we are now committed to creating an outreach campaign that will continue to put pressure on local, state and national agencies to stop the leaking of this valuable but toxic gas. 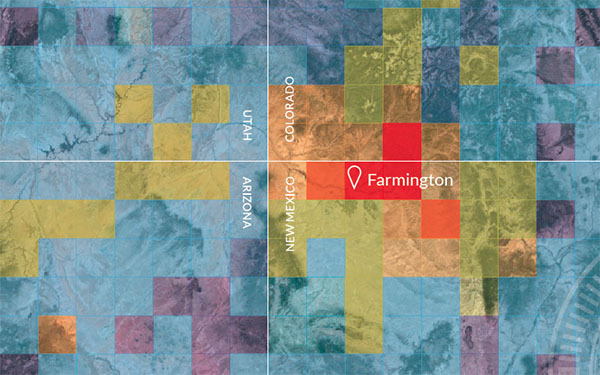 New Mexico’s San Juan Basin is scarred by tens of thousands of oil and gas rigs that are responsible for the 2,500 square-mile methane cloud hovering over the region. This “hot spot,” roughly the size of Delaware, was first discovered by satellite imagery in 2003 and is the largest concentration of methane in the United States. It is the #1 contributor to climate change in New Mexico and must be stopped. Venting, flaring, and leaking natural gas contributes to climate change pollution and public health risks while wasting taxpayer and corporate revenues. We deserve better. Other states have already taken successful measures to reduce methane pollution and New Mexico needs to join the ranks. Help us launch a new campaign to let our leaders know that leaking methane is harming our public health, our environment and our economy. We need you to help us make some noise. Get involved and donate now: thrive@cavu.org. How much do you know about Methane? Methane, the primary component of natural gas, is an extremely potent greenhouse gas with the capacity to trap more than 80 times the warming power of carbon dioxide. Unregulated drilling and fracking operations are associated with toxic air pollution leading to decline in air quality and increased risk of asthma, respiratory illnesses, and cancer in both workers and nearby residents. The oil and gas industry practice of wasting natural gas from public and tribal lands costs communities and tribal governments millions of dollars each year that could be used to fund schools, health care, and needed infrastructure improvements. Above image: Illustration demonstrates hotspot of methane anomalies in the Four Corners.